Three piece usher suit, jacket cami and skirt. Two piece usher dress with jacket. Three piece usher suit in georgette with jacket, cami and skirt. Three piece usher pant suit in georgette with ribbon trimmed jacket, cami and pant. Two piece usher pant suit, two button closure jacket and pant. Two piece usher pant suit, double-breasted jacket with pant. Two piece usher pant suit with four button jacket and pant. Two piece usher pant suit, three button jacket with pant. Two piece usher suit with single button, jacket and skirt. 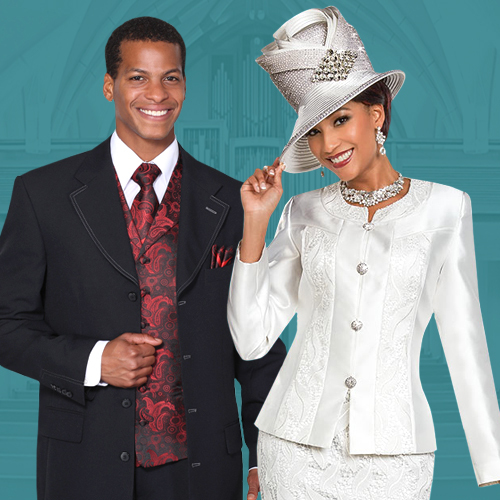 Two piece usher suit with rhinestone buttons, satin piping and pleated hem, jacket and skirt. Two piece usher suit with rhinestone brooch, jacket and skirt. Two piece usher suit in peachskin, rhinestone button closure and brooch on jacket with pleated detail skirt. Two piece usher suit with double-breasted jacket and skirt. Comes with matching gloves. Two piece usher suit with two button jacket and skirt. Comes with matching gloves.